Fresh pears are the star of this salad, a favorite menu item from the Heartline Café in Sedona, Arizona. In this creative showcase, aromatic Bartlett pears are pureed into a sweet-tart dressing as well as tossed in with crunchy Bibb lettuce. 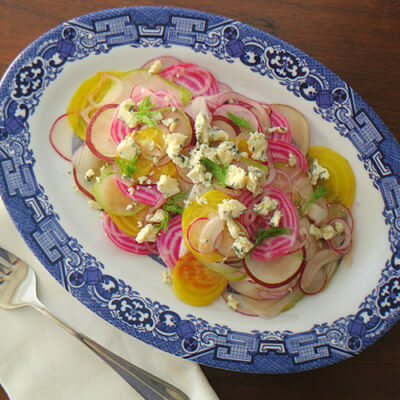 Crumbled Gorgonzola adds a savory flavor that is the perfect complement to sweet pears. Peel, core, and chop one pear. Place pear, ⅓ cup water, sugar, and tarragon in a small saucepan. Simmer over medium heat until pear pieces are soft, about five minutes, depending on ripeness of pear. Do not let all the water evaporate. There should be about ⅞ cup pear and liquid. Cool. Pour pear and liquid into a blender and blend until smooth. Add part of the vinegar and lemon juice to taste. Taste and adjust sugar and acid to make a sweet-tart dressing, adding a little water if needed to thin. Refrigerate until cold. Core and thinly slice remaining 2 pears. For each serving, arrange 3-4 lettuce leaves on a salad plate. 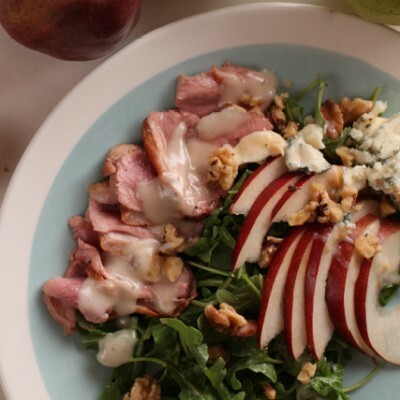 Top with ⅓ of a sliced pear, 2-3 tablespoons Gorgonzola, and drizzle with 2 tablespoons dressing. Serve immediately. I’ve been eating pears chopped into salads for years, but this recipe introduced me to the whole new world of including pears in the salad DRESSING. Yum! One of my favorites, to be sure.